Our question this week was, “What are buildings made of?” We examined samples of flooring and each child shared with the class the characteristics. This allowed the students to learn the social rules of communicating. As each child spoke, we had to listen, be a polite audience, take turns, and speak so the listener understands. Some of the characteristics said were soft, hard, smooth, and flexible. We also discussed, how other materials are used to build things. Using plastic cups and popsicle sticks, I asked the boys and girls to build a bridge like the one in our book The Three Billy Goats Gruff. Each child built a bridge to get the goats to the other side. You would have thought it was Christmas morning. They were so excited! 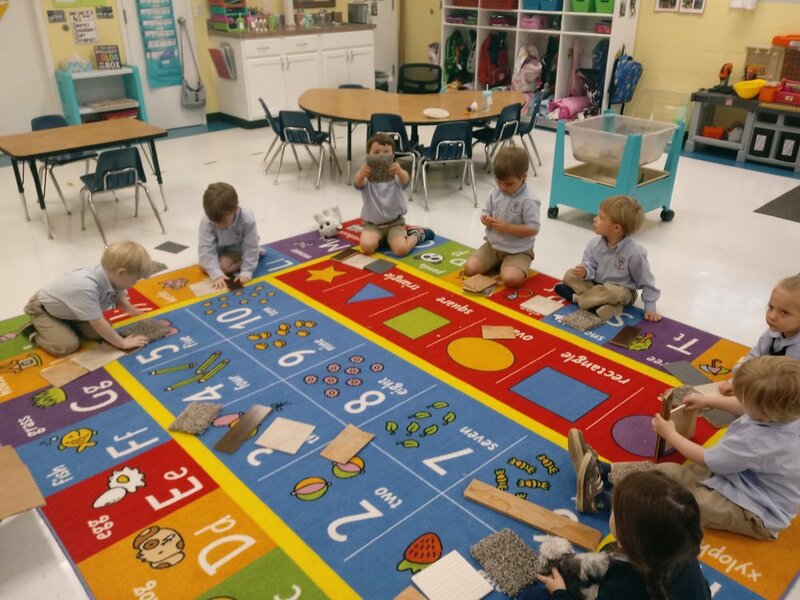 Children solve problems by using available resources and materials to overcome obstacles and achieve goals. Positive evaluative feedback from adults helps children persist with difficult tasks. After each child presented their bridge, we used the popsicle sticks to make stick letters. A young child's alphabet knowledge, especially their ability to rapidly name letters in random order, is a strong predictor of later reading, writing, and spelling ability. 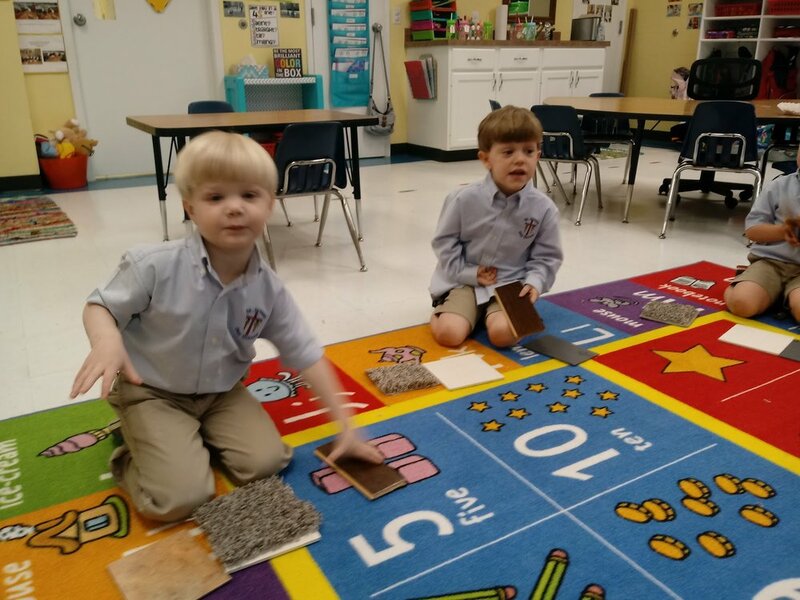 Working on our fine motor skills, the boys and girls used sandpaper to make the wood smooth. As each student develops physically, they master increasingly sophisticated tasks and are able to meet more of their own physical needs, such as dressing themselves. Another activity the children love to do is play in our sensory bin. Sensory bins are more than just fun, they’re an important part of any early childhood learning experience. When children can see, smell, touch, and even hear something, the learning experience is more meaningful to them, and therefore more effective. Sensory bins let a child explore, discover and create play using practical life skills (dumping, filling, scooping, measuring.) Through the use of sensory bins, valuable play skills are learned. This week will be our last week to study buildings. We will be moving on to our recycling unit. I can’t wait for you to see the activities I’ve planned. How We Use The Story of The Three Little Pigs. Children talk to express feelings, gain information, make requests, understand concepts, and share ideas and stories. With lots of practice over time, children develop the ability to speak clearly and to tell personal stories as they describe objects, people, and events that are familiar. Last week, we read The Three Little Pigs and discussed what each pig used to build their house. This week, each child chose what house to draw and I asked them to recreate it using crayons. The boys and girls had to closely examine each one of their houses and draw what they saw. Each child then shared their drawing with the class and spoke about the details. Narrative talk is great because it requires our class to use more complex language. I also presented a story problem using three pigs. The pigs were hungry and we needed to feed them. After feeding them, one pig went to take a nap. I asked the children “How many pigs are left?” They all shouted two! 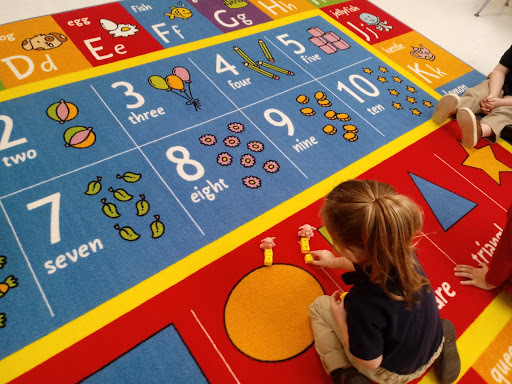 Taking away is a common separating operation that makes a collection smaller and answers the question, “How many are left?” Children can often solve subtraction problems before they can solve addition problems. We also use this concept during our snack time. We started our new study about buildings and the boys and girls are excited. They want to know how they are constructed and what people do inside them. Each child chose a picture of a building and as a class we discussed the different characteristics and features. They varied in size, color, construction, material, function, and location. This study will offer many opportunities for our students to explore buildings first hand. One of our lessons this week was to talk about the vocabulary words more and fewer, as well as their meaning. After listening to the story of Rapunzel, we built our own towers using interlocking blocks to compare. I put the children in pairs and asked, “which one of you used more blocks than their partner and which used fewer.” Each child then placed their name on the graph stating their answer. Our class is able to look at a small group of objects and identify without counting. This is subitizing. We will continue to explore concepts of more and less, parts/whole, and how many. Step up! This is a game we played using our alphabet knowledge. I showed each child a letter and asked them to step up and erase that letter on our dry erase board. Everyone was ecstatic to come up to the board and find their letter. Preschool children’s letter knowledge is a unique predictor of growth in phonological sensitivity. On Tuesday when we walked back from Chapel, it was freezing. I surprised the class with hot chocolate and cookies. What a wonderful way to start your day with Chapel, hot chocolate, and cookies. Tuesday we visited the Library for the first time. Each child had a chance to look for a book and find a spot to look it over. We also had story time with Chase, Able's Mom. The boys and girls enjoyed being read to so much that they wanted her to read another book. We even checked out two books to read at rest time. At age 3, differences in children’s understanding and use of literacy skills are enormous. Reading aloud to children appears to be one of the most important activities for building the understanding and skills needed for reading success. Everyone was amazed with all the books! I tried to trick the boys and girls by playing a game called What’s Missing? Using four items, I would remove one and ask, “what’s missing?” They did so well that I had to add a fifth item. As children develop their abilities to attend and to use memory strategies, their learning is enhanced. The study of patterns is exciting for young children. They first learn to copy simple patterns made with objects. They later learn to extend and create their own patterns. The children had a chance to demonstrate their knowledge of patterns. Each child had a bowl with 3 balls and they were paired up with another student to create their pattern. I asked them “What else can we make a pattern with?” One child said, “our shirt colors”. Each child stood in a pattern by the color of their shirt. It’s great to see our class working together. We also had fun using dinosaurs for a counting activity. Each child was given a card with a number. They had to match the correct number of dinosaurs to the number on the card. This is also a great activity you can do at home. During snack ask your child to count out a certain amount before they eat. Learning and eating, it doesn’t get better than that! The best way to learn science is to do science. Using the classic story, The Three Little Pigs, the students continued their study of force and effect. Blowing through a straw the children used their breath to move a pom pom ball like the wolf did to blow down a house. Young children are natural investigators. They are curious about how things work and what will happen next. I enjoyed watching the boys and girls discover that the more force they used with their breath the further the pom pom ball would go. We also danced with scarves. Not only was this a fun way to teach children about force, but spatial awareness, too. 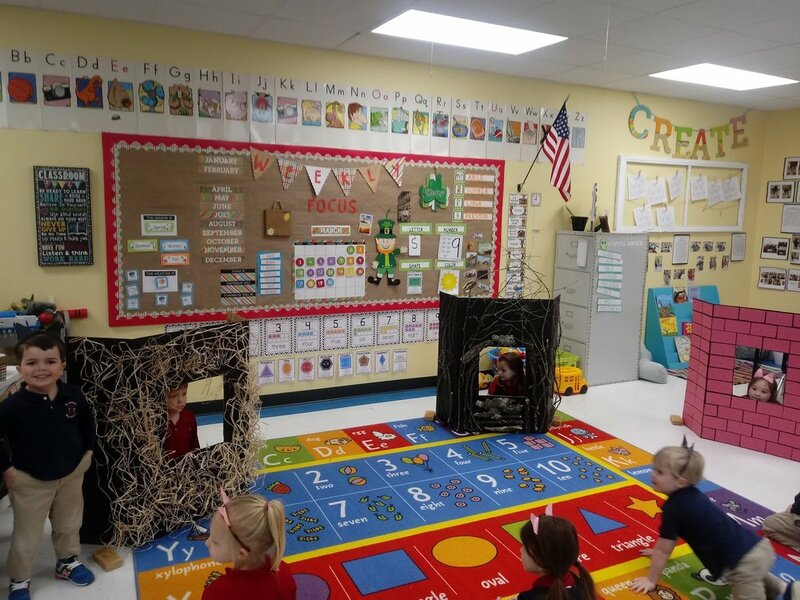 As they learn to navigate their environment, they learn about direction, perspective, distance, and location. Using positional words and force, we moved our scarves around. The children loved listening to the music and waving their scarves to make different positions and shapes. When we use positional words it helps describe spatial relationships and helps children deepen their understanding of those relationships. Another fun learning activity was making snow for our sensory bin. We buried magnetic letters in the snow for each child to find and then spell their name. This activity teaches children to understand that these symbols can be grouped together to form words and that words have meanings. The idea that written words are composed of letters that represent sounds is called the alphabetic principle. Children’s understanding of the alphabetic principle is a predictor of future reading success. As you can see the boys and girls had a great time searching for letters in their name to place on the tray.